LG reveals UK pricing for 2019 4K OLED TVs | What Hi-Fi? 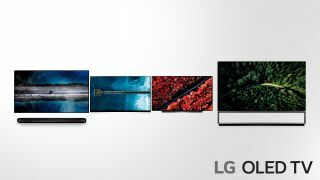 We've known about LG's 2019 OLED TV ranges, including their specs and features, for a couple of months, and now we have the missing piece of the puzzle - pricing. The structure for LG's 4K OLED TVs follows a similar pattern to 2018. The entry-level OLED55BPLA and OLED65B9PLA (which use the Alpha 7 Gen 2 Intelligent Processor) cost £2000 and £3000 respectively and go on sale on the 1st July. The step-up OLED55C9PLA and OLED65C9PLA (which use the more powerful Alpha 9 Gen 2 chip) cost £2500 and £3300, while the 77in OLED77C9PLA is £7500. These sets will be first out of the blocks and hit stores on the 22nd April. Move up to the E9 range and the 55in OLED55E9PLA costs £3000 and the 65in OLED65E9PLA can be yours for £4000. This range hits stores one week later, on the 29th April. LG's W9 wafer-thin wallpaper range returns for 2019 and it's available for £7000 if you opt for the 65in OLED65W9PLA or a whopping £13,000 if you go for the supersized 77in OLED77W9PLA. This range goes on sale slightly later, on the 6th May. There's no word as yet on pricing for the 88in Z9 8K model nor the fancy 65in R9 rollable OLED set. These sets are only due for launch in the second half of 2019, but it's fair to assume they won't be cheap. Given the imminent arrival of the new sets, there are some great deals to be had on LG's 2018 OLED TVs, with a 55in C8 available for under £1500 and a 65in C8 for around £2400. Head over to our best OLED TV deals page for all the latest offers.